. . . . . H O M E . . . . .
. . . . . F O U N D . . . . .
. . . . . F L I C K R . . . . .
. . . . . C R A F T Y L A D Y . . . . .
. . . . . SHOP . . . . .
. . . . . IG . . . . . 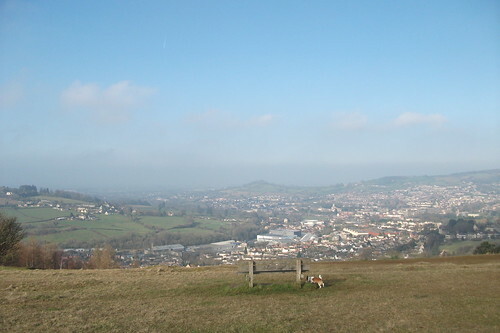 It's cold and bright here today, not quite spring, but it's not far away. The other day as I drove along I saw a patch of crocuses planted by the road. My heart gave a little leap of joy! which led to a little crochet, of the purple and mauve kind. and the finishing of a pretty cushion. 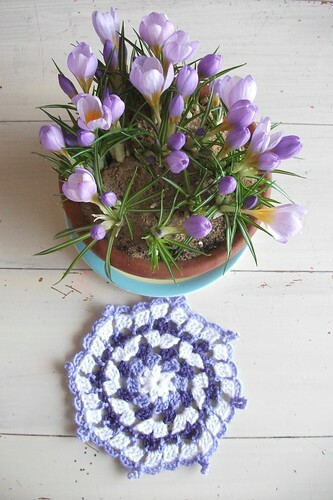 if you would like to see even more crocuses you can look here! Thank you for your wonderful comments on my last post, it was really very heart warming. Life still has it's trickyness, this is true for all of us I'm sure. But it feels less intense now, thank goodness! This blogging community has led to some great inspirations and ideas to try. I will keep you posted. Hi Heather i wonder if you can help me, i would love to learn to crochet, do you know of any good books or magazine that shows crochet for the beginner? Flowers always make me happy too. Enjoy! Love all your crochet, too!!! Lovely how spying a flower can put you on a rollercoaster of creativeness! 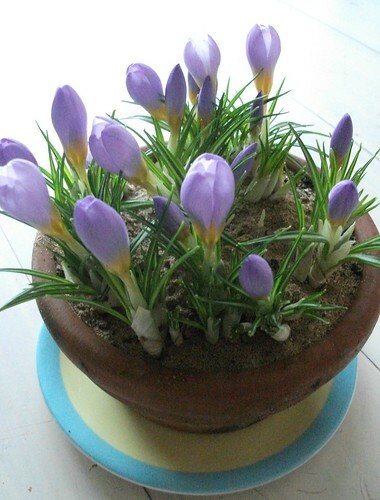 Beautiful crocus Heather, glad they've cheered you up! Such a beautiful color!!! Love your cushion!!! and the view is just magnifisant!!! Clearly, the coming of Spring is cheering you up a lot!!! Enjoy it!!! It's funny how one thing leads to another! spring flowers always cheer me up. I love crocuses. They just bring hope that spring is on the way. And I love how you showed how one thing led to another in your life. Have a great day. 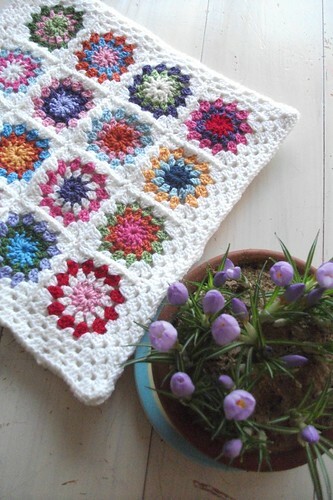 your crocheted cushion is gorgeous ~ love the colours you've chosen! It's so true how little bursts of flowers bring light and hope to your day! For me, here, it is forsythia. Not a particularly nice blossom to photograph, but it's always one of the first harbingers of spring that fills me with positive thoughts. Crocus' are rare here. Squirrels eat the bulbs, I think. Or else, like tulips, the ground doesn't go cold enough from one year to the next. 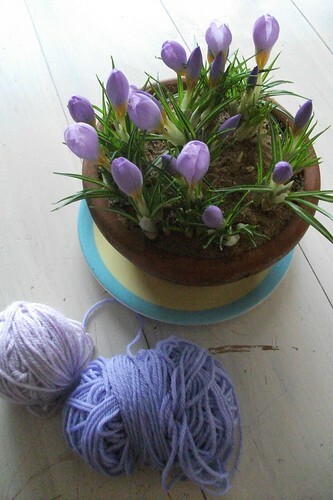 I love the way your crocuses inspired so much colour and creativity. I have been admiring them here and there in people's gardens and along the side of the road and they do make me happy. Lovely ~ all of it! 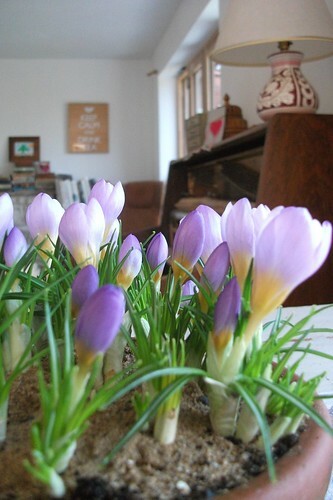 And seeing the crocus in bloom is such good Medicine for me at the moment … as I watch the icy snow falling outside. And now I'm thinking I'll fetch my hooks and some yarn after dinner. Thanks for the inspiration! What a great colors with the flowers in purple. Beautiful! Do you really need to open your bedroom window when you sleep? Make it! The Lovely Funny Hat !!! In search of a new creative home. hArts on Main in Christiansburg, VA!